This uncommon surname is a variant of the more usual Arkwright, itself an occupational name for a maker of chests, widely found in Lancashire, and deriving from the Middle English and Old French "arc", ark, chest, coffer, via the Latin "arcere", to shut in, enclose, with "wrytte", maker, craftsman. In northern England, the term "ark" was used specifically to describe a meal-chest, and a quotation from the medieval "Tale of a surer" reads, "When this corn to the kniht was sold, He did it in an arc to hold, And opened this arc the third day". Early examples of the surname include: John de Arcwryt, mentioned in a Descriptive Catalogue of Derbyshire Charters, dated circa 1272; Thomas the Arkewrytte, noted in the Cheshire Assize Rolls, 1286; and George Arthwright, entered in the 1450 Register of the Freemen of the City of York. In 1494, one William Hartwright was recorded in the Register of the Corpus Christi Guild, York City. 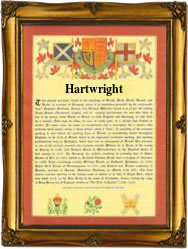 The name has several variant spellings in the modern idiom, ranging from Arkwright and Artrick, to Hartwright, Hartrick and Hattrick. On May 15th 1609, Anne Hartwright and Thomas Jennings were married at St. Gregory by St. Paul, London, and on June 21st 1818, Sarah Hattrick married John Edwards at St. Dunstan's, Stepney, also in London. The first recorded spelling of the family name is shown to be that of Gilbert de Arkewright, which was dated 1246, witness in the "Assize Court Rolls of Lancashire", during the reign of King Henry 111, known as "The Frenchman", 1216 - 1272. Surnames became necessary when governments introduced personal taxation. In England this was known as Poll Tax. Throughout the centuries, surnames in every country have continued to "develop" often leading to astonishing variants of the original spelling.